Another of our wedding designs from our clip art gallery coupled with a cute saying that will attract your guests attention. A nice color combination of burgundy with a white imprint completes this attractive grouping in the premium selection. A low minimum of 25 coolies, 27 different color selections, 26 awesome imprint colors, you will have so many combinations to choose from. Make it special, make it all about you and your special day! Prices start as low as $.41 per koozie and make this a beautiful as well as economical gift from you that will last for years to come. Don’t forget that all of the examples on our web site are only samples. Each and every order is customized exactly how you would like it with your choice or font, design, colors and layout. 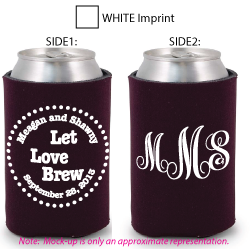 Request your free koozie proof today.